Today, the Liberace Foundation breaks down another wall on the way to exemplary transparency. When I was recruited to the Board of Directors of the Liberace Foundation in 2012, I soon realized that none of the remaining board members had information as to how much money the Foundation had granted over the years. I heard and read estimates of $3 million to close to $5 million, which would place this foundation in quite good company nationally. Soon after the dust settled when I became Chairman of the Liberace Foundation last year, I issued a directive that the staff complete a report of all scholarships and grants ever distributed, as well as tracking down the names of all recipients, some of whom have gone on to be quite famous in the arts. To complete this report, they would have to gather rooms full of files from three different locations, organize, calculate and digitize their findings. It would be a monumental task. To my delight, the staff, lead by Andreas Sparkuhl, was excited to jump in and get to the bottom of the records. I’m thrilled with how Andreas and Billy Marino didn’t hesitate to take on the job, along with help for Dallas Reiber when she wasn’t busy helping us organize the rest of the records of the Foundation’s last 38 years. The staff at the Liberace Foundation for the Performing and Creative Arts is pleased to provide the following report of all scholarships and grants disbursed by the Foundation from 1981 to 2011. The results were astounding. Total grants and scholarships of nearly $6 million, to over 2600 students, at 108 schools (see below). Additional funds remain, in endowment funds created at certain universities, requiring more investigation. Would you know some of those students? You certainly would. But we’ll leave those surprises for another day. This information is public by law, and now, finally, it is public in fact. I am extremely proud of our team, all locals and recent UNLV grads who love the cause. On behalf of the Board of Directors and the Advisory Board of the Foundation, I thank them for this extremely important work. Excellent job! I am so very proud of each and every one of you in completing such a monumental task!!! This is impressive. God bless Liberace’s legacy in helping so many, and continuing to do so. How nice that you undertook such an extensive job, identifying all of the scholarships that have been gifted to deserving students. Over six million dollars is very VERY impressive! The foundation clearly has helped many students over the years. The Foundation should be brought more into the limelight so that more contributions can be made to it to help more students in the future. Unfortunately when the media is filled with stories of how the museum has closed its doors people are under the false impression that the whole foundation is defunct. Congratulations Mr. Warren on the wonderful job you and the foundation are doing both to help promising students as this was Liberace’s dream, and for keeping the legacy of Liberace alive. Excellent job to all involved in the task and God bless Liberace and his memory for his generosity and kindness in helping out so many people. Many thanks and much gratitude also to those of you who keep his foundation going like a fine tuned machine. My Mother Estelle Liberace Forlano was Lee’s and George’s first cousin. My father was a Dentist and did Lee’s teeth when he was a struggling musician. He would come to our house every year that he played in the Latin Casino in New Jersey. They were both great people. This report is an excellent set of details, covering 1981 to 2011, 30 years. I read this as a total of $6 million distributed in the 30 years. I calculate the disbursements as $200,000 per year, roughly. The 990 IRS Forms would show total disbursed for the years 2012 to 2013, maybe 2014. I look forward to more light, more light. 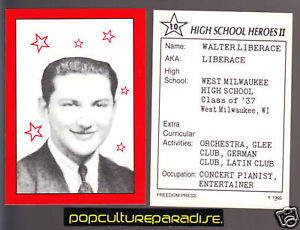 Love Liberace’s skill as a pianist. Props to the foundation for their transparency.